A cavity is a hole in the tooth caused by bacteria (that live in plaque) which use sugar to create an acid attack on your tooth. If cavities are left untreated they can cause pain, infections, and problems which affect developing permanent teeth. Dental pain is the number one reason children miss school. Decay is 5 times more common than asthma. One out of ten 2 year olds has one or more cavities; by age three, 25% of children have decay; by age 5 almost 50% have decay. Cavities are 100% preventable. It is easy to avoid cavities. Simply remove the food or sticky plaque from your teeth by brushing and flossing so the bacteria can’t live there long enough to cause a cavity. 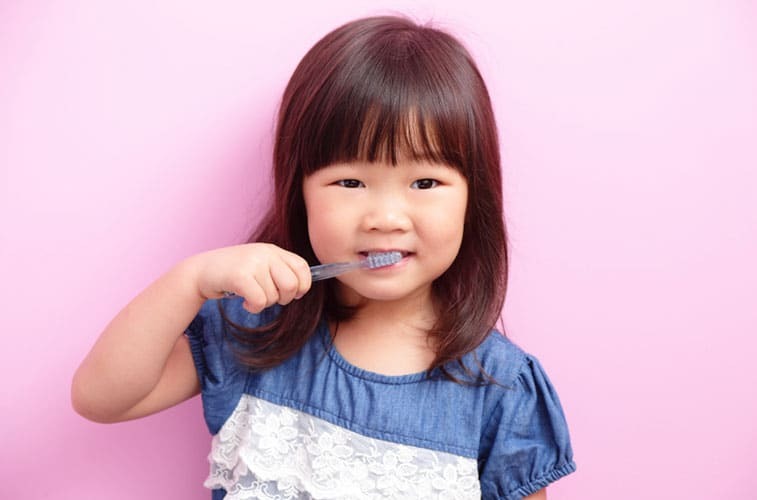 Primary teeth, or baby teeth, are the foundation for a healthy mouth. They are important for (1) proper chewing and eating, (2) maintaining space for the permanent teeth and guiding them into the correct position, and (3) permitting normal development of the jaw bones and muscles. While the front 4 teeth (incisors) last until 5-8 years of age, the back teeth (molars) are not replaced until age 10-12. If cavities are left untreated they can cause pain, infections, and problems which affect developing permanent teeth. Dental pain is the number one reason children miss school. Be careful of snacking too frequently between meals. Choose nutritious food to snack on—pick fruits, vegetables, low-fat cheese, and yogurt instead of sticky snacks like fruit snacks, raisins, and craisins. Have your child measure the amount of sugar in the snack to visualize how much they are actually consuming! Clear the snack from the teeth as soon as possible. Brush or swish and rinse with water. Drink milk with meals and water with snacks. Avoid all sugary drinks like pop, juice, Gatorade, and chocolate milk. Hubba Bubba Bubble Gum – 1 pc. Reese’s Peanut Butter Cup – 1.5 oz. Gerber Fruit Snacks – 1 oz. Scooby-Doo Fruit Snacks – .8 oz. Welch’s 100% Grape Juice – 10 oz. Mt. Dew – 12 oz. Ocean Spray 100% Orange Juice – 15.2 oz. Land O’ Lakes Chocolate Milk – 12 oz. Bug Juice – 10 oz. Sunny D – 16 oz. 100% Apple Juice – 6.75 oz. Kool-Aid Jammers – 6 oz. BeechNut Yogurt Juice – 6 oz. Motts Apple 40% Less Sugar – 6.75 oz.